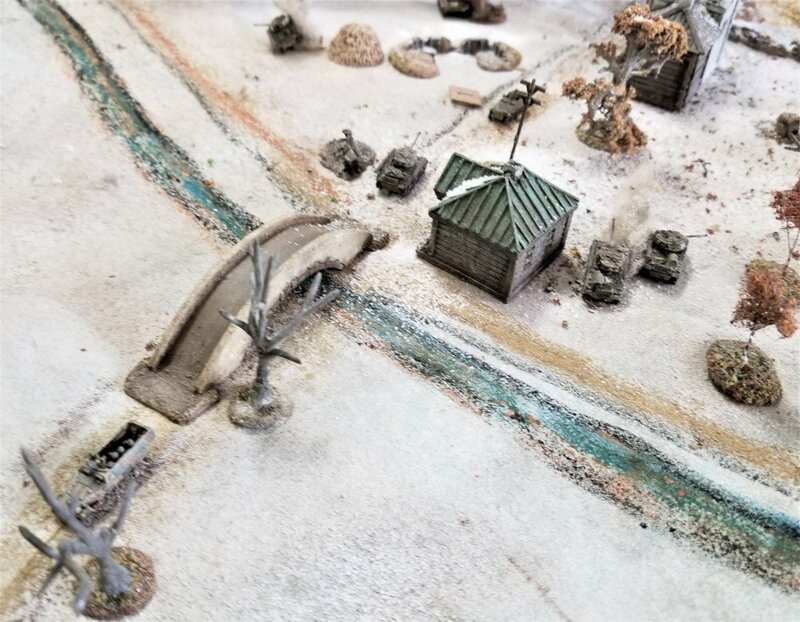 This action takes place north of the Danube as a Kampfgruppe of the 20th Panzer Division swings left to get behind the Soviet lines around Bucs. The Danube would be off to the left in this picture. The Obidsky Canal is on the right side of the table (north edge). The Germans (William) would enter along the south edge with eight Panzer IVH/Js and Sdkfz 251-mounted Panzergrenadiers: two 4-section companies, two Stummels, two MMG teams and an FO for a couple of 82mm mortars. I put a Blitzkrieg and Rapid Deployment card in for them and they had a+2 Tank ace. The only way to get across the canal was via two bridges . The table is flat and cut by several hedges. The farm off to the right is unoccupied. There are some defensive works facing east from the earlier actions in which the Russian forced the Axis defenders back. The Russians (Randy and myself) had the remains of the 30th Guards Mechanised Brigade of the 9th Mechanised Corps: six M4A2s (76mm), two Valentine IXs, and six sections of Guards infantry, supported by two MMG teams and three ATR teams. There was an FO for a section of medium mortars. And four SU-76s from the 697th Self-Propelled Artillery Regiment were also available. We would start coming in as Blinds on turn two from the north edge so we had to cross the canal. We also were low on AP ammo, so when a tank rolled doubles, we would only have one more turn of firing. The SUs had to roll doubles twice. This proved to be unnecessary. 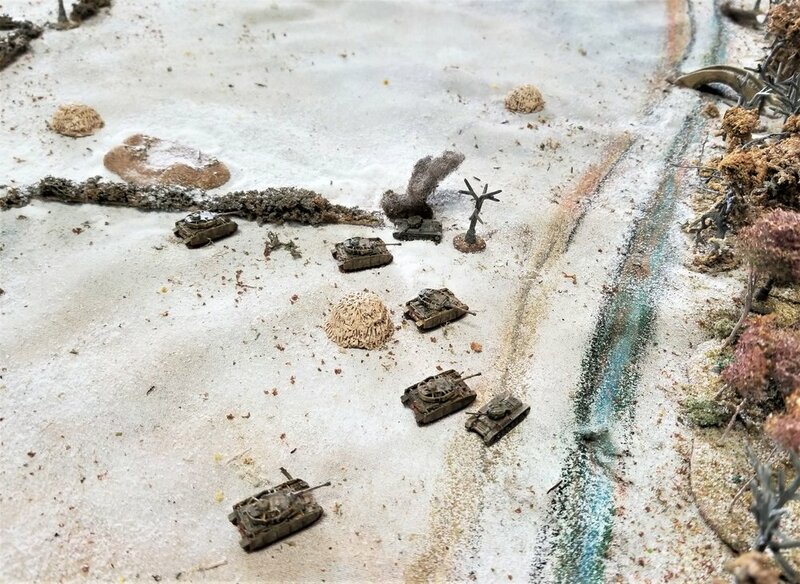 By the time I got my M4s across the canal, William had gotten up to a nice position along a hedge with a platoon of Panzer IVs. One of the 251s broke down along the road and the occupants hoofed it to the hedge just outside of the farm. One of the defensive works is off the road to the left. That did slow the Germans down as they made sure they were unoccupied. The abandoned halftrack is also in the pic. In the background are some Blinds that are the lead right hand Germans. They moved through the other farmstead. German dummy Blinds are moving on the other side of the far hedge. The Shermans did get some shots out at the Panzers, but failed to damage them. 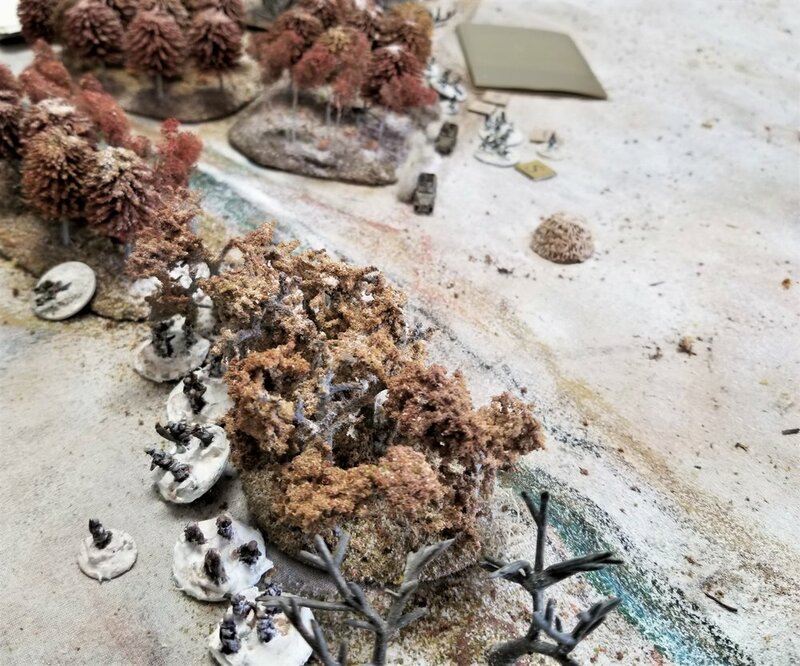 Grenadiers move off to the left to avoid the tanks. 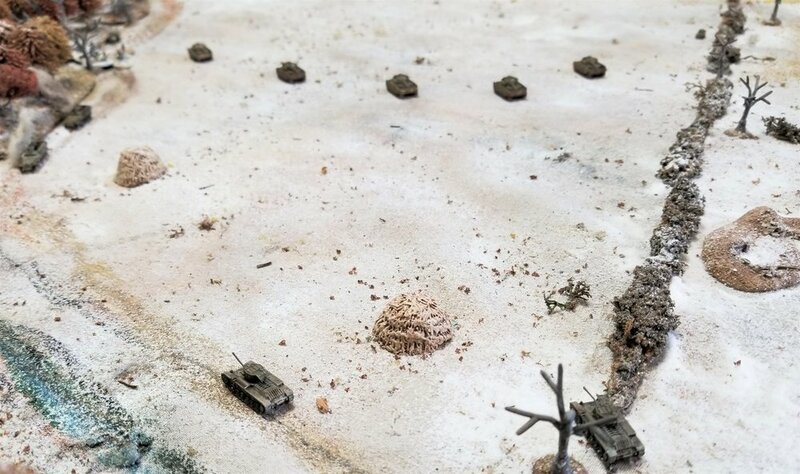 The Panzerscheck team prepares to take a shot at the M4s. 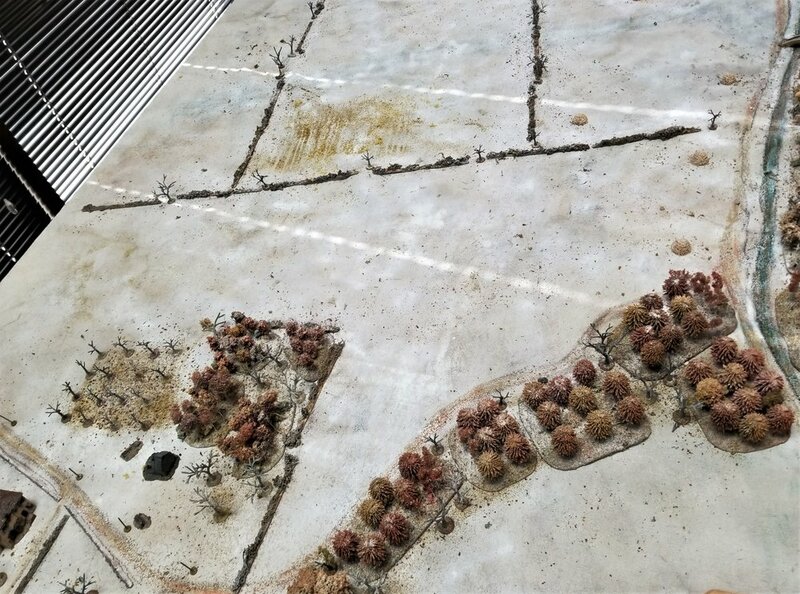 Another previously prepared entrenchment is shown next to the Grenadiers. Still no hits on the Germans. More M4s on the Blinds beginning to cross the bridge. And take out two halftracks. They need to find out what is under all the other Blinds heading their way though. Seeing the Grenadiers scramble from their mounts gave the Red infantry some great targets. Randy opened up with a platoon and an MMG team and chewed up one of the Grenadier sections before it could get back to the trees and cover. 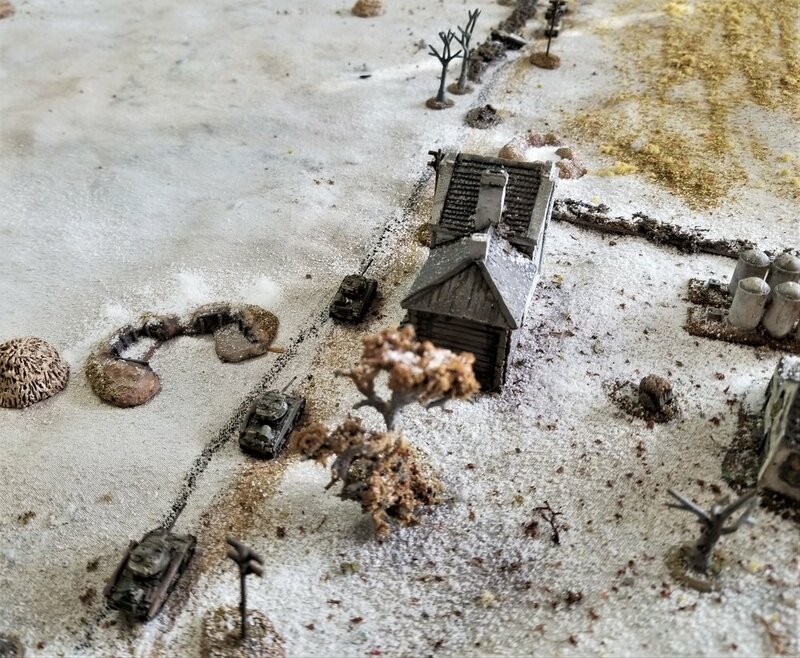 The canal was a barrier to all sides though, and Randy's infantry was unable to get any closer to the weakened German infantry for the rest of the game. This was the Russian problem. We were just too slow (or the Germans were too fast) in getting on the table. The bonus moves for the Germans put them across the table and in position to cover the two bridges before we could get most of our units out. But with no infantry support and the Panzer IVs waiting for the slightest chance of a shot, I got very cautious. The leader's M4 did hit a Panzer IV but it didn't seem to do much. Then he took a couple of hits, knocking out his gun and damaging the engine so he bailed. I started banging away at the houses to deny them to the Grenadiers as cover to sneak up on me. And the Valentines quickly get knocked out - not before doing no additional damage to their foes. Nice thing about this scale and rules set is that it looks right. No silly fender touching. I guess I should have drawn some track marks behind them. 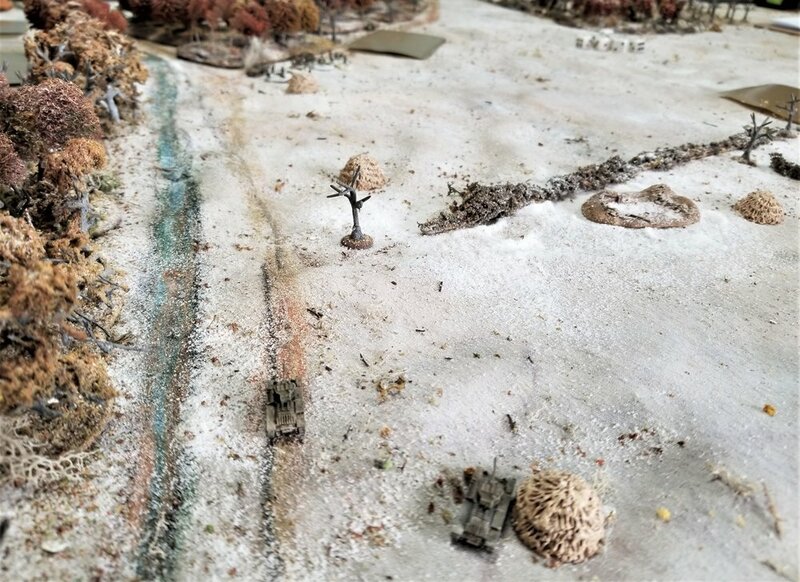 Sdkfz 251/9s start to target the infantry in the trees on the far side of the canal. They were surprisingly ineffective with their shots. There was no good cover to cross the canal and Randy was stuck on the north side of the canal. The ATR teams aren't going to stop this group. And a few shots from the Panzerschreck and Panzrfaust will do it. The Panzer IV on the road has also broken down. The SU-76s might have done something but alas, they didn't even get on the table. The ATRs did cause some consternation, but not enough to stop the advance towards the bridges. The MMG and ATR team on the right did cause some casualties on the Grenadiers to the right. If they could stop the halftracks it would be a moral victory at least. And past the smoking Emchas. The ATR tried a couple of shots but missed. A big victory for the Germans. Not a good showing for the Guards in this game, but they never had good field position. The Rapid Deployment cards came up every time possible for the Germans and really aided their advance. Overall Russian losses were all the armor-6 M4s and two Valentines. Infantry-wise they had one infantry KIA and one ATR team eliminated. The Germans had one bogged Panzer and anther with a gun sight damaged (their tank ace). 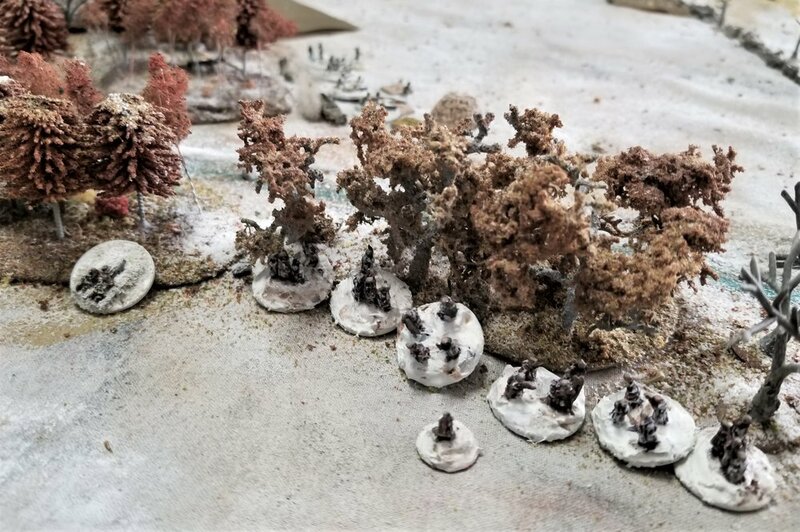 One infantry section was wiped out and they had five other casualties. They never even deployed their MMG sections and half of their infantry. 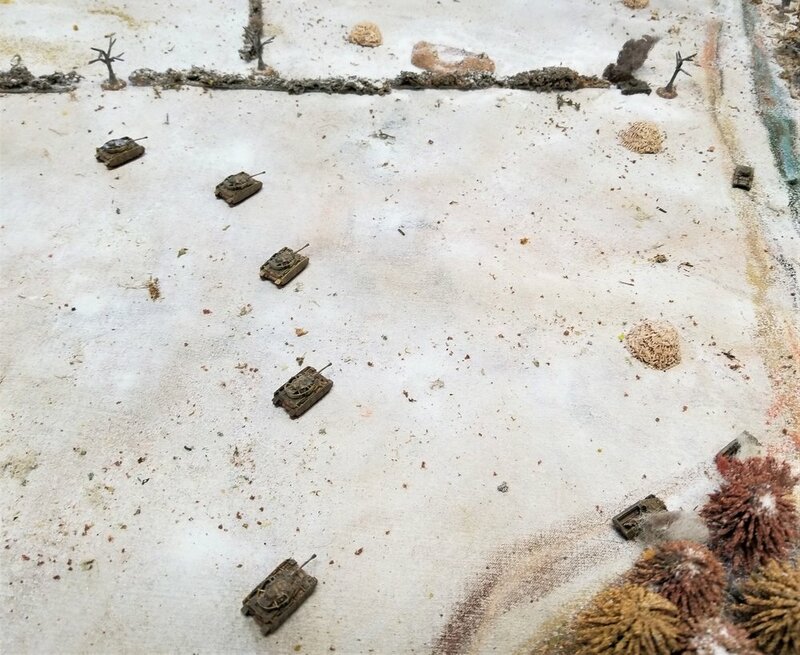 A good winter battle that demonstrated the advantage of coordinated movement between tanks and infantry.